Apply a thin coat of ARCTIC FREEZE onto the entire nail making sure to cap the free edge. Apply a second coat for full coverage. 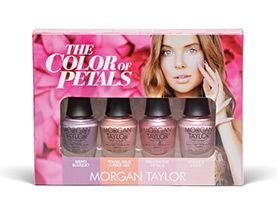 Using I FEEL FLOWER-FUL, apply product near the free edge, center and cuticle. Next, using a Mini Striper Brush, quickly drag product up and down. Repeat step 2 using MERCI BOUQUET. Repeat step 2 using FOLLOW THE PETALS. With the Mini Striper Brush and BLACK SHADOW, paint outlines of a flower near the free edge, sidewall and cuticle and add details. Finish with NEED FOR SPEED top coat.